Henry Gant, Man About Town. This Episode: 100 words writing contest. This week's words "Fighting/ray". The Writers Block is hosting a 100-word story competition. 100 words are enough to tell a complete and compelling story. I enjoy it. This week our prompt words are "Fighting and Ray." You are the champion of our civilization. A ray of strength and hope in this Universal fighting. Our empire shall ever endure. Like you, I take my assignment immediately after my son is born, he will never know me. who I name after you. On this day, from across the Universe, I shall chisel your name into the base of a granite pillar. Henry Gant took the picture you see. And wrote the story you read. 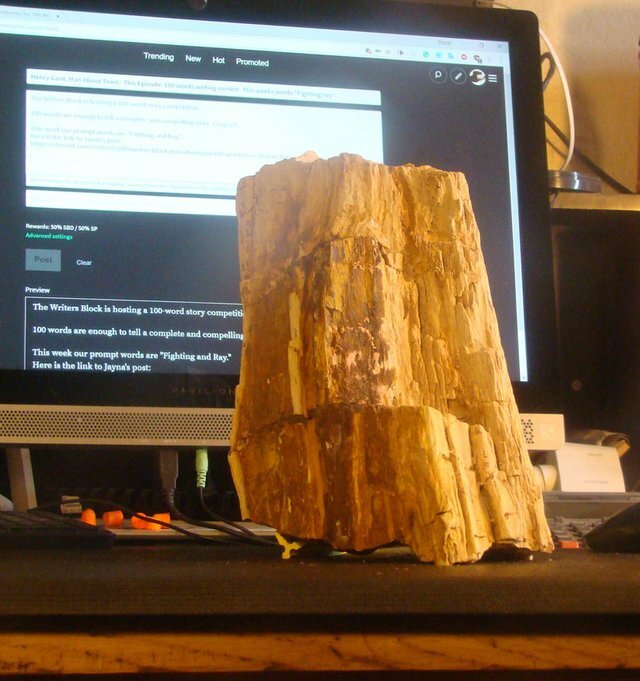 The wood petrified million of years ago on its own. Percy Bysshe Shelley and poet Horace Smith entered into a friendly competition; both writing a sonnet on the same topic. I imagined that the friendly competition is still open to anyone and that I can enter. They choose to explore a passage from the Greek historian Diodorus Siculus, which described an Egyptian statue with the inscription: "King of Kings Ozymandias am I." It is the only remnant of the Ozymandias' kingdom which has vanished to history. This is especially relevant today as there are growing clues to a vanished civilization much more advanced than we presently care to admit/study/acknowledge. Nice story I am thinking of joining too but have to do the 50 word prompt first. will google it later I am not certified writer and maybe it will help me. Mucha historia hay en ese pedazo de Madera se ve grandioso @henry-gant también me encanta conocer un poco más de la cultura egipcia, solamente el nombre suena muy llamativo "Rey de Reyes Ozimandias soy Yo." Enjoyable story, @henry-gant! And thank you for the backstory. I love reading about the perspective and thought process that went into a piece of fiction. I honestly thought you might be making up Ozymandias, but I Googled the name. The Shelley poems and a wiki surfaced in search results, so it is in fact true. How very interesting! Just the Idea that Ozymandias gave up his family to establish an empire. Only to have it erode to sand. In the end . . . the empire was no more important than family.